Charging an electric car may soon be as quick and easy as refueling at the pump. 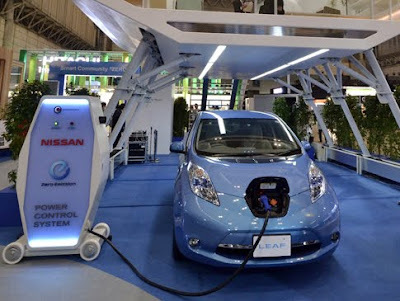 Nissan, in conjunction with Japan's Kansai University, says it has created the necessary technology to charge the batteries needed by vehicles such as the Nissan Leaf and Mitsubishi iMiEV in a record time of ten minutes. The findings, reported by Nikkei news agency last week, could represent a huge leap forward in public acceptance of electric vehicles, hindered to date by sluggish charge times -- a full charge of common EVs today can take up to eight hours. The breakthrough reportedly came by changing the electrode inside a capacitor from carbon to tungsten oxide and vanadium oxide to improve power, reports Asean Automotive News. Batteries charged using the updated system were complete in ten minutes, with no significant effect on storage capacity or voltage, the reports said. Although it could take a decade to commercialize the technology, such a significant breakthrough could dramatically boost public perception of electric cars. Last month, Nissan launched a new fast charger in Japan costing less than Y1 million ($13,015), half the price of its previous charging unit. The new model is nearly half the size in volume than previous incarnations and can charge electric vehicles from multiple automakers, Nissan said.